(Taken from my Masters dissertation of 2009 — Nonpartisan Engagement in Public Affairs: A Critical Analysis of the Bahá’í Approach to Dialogue, Democracy, and Diplomatic Relations). While the Bahá'í Faith clearly supports the idea of representative democracy and is correspondingly opposed to all dictatorial forms of governance, it is important to note that the Bahá'í approach is distinct for a number of reasons. Strongly committed to nonpartisanship and non-electioneering, and based not only on the principles of equality and freedom but likewise on the spiritual principle of dignity, the approach contrasts starkly with well-known characteristics of so-called liberal democracy (Effendi, 1974, 1977, 1990; Abizadeh, 2005). As already implied in the previous chapters, it seems largely uncontested that a crisis of confidence is facing contemporary democracy as manifested in, for example, decreasing trust in societal institutions and the breakdown of social capital (BIC, 2009b; Effendi, 1977; Fukuyama, 1995; Putnam, 2000, 2002; Putnam and Feldstein, 2003; Halpern, 2005). The crisis of modern day society is featured in both the authoritative writings of the Bahá'í Faith and in various texts written on the Bahá'í subject. It is fundamentally explained as a spiritual crisis with social issues prominently involved—related to ethical behavior, inspired vision, and mutualism or, rather, lack thereof (Bahá'u'lláh, 1976; ‘Abdu'l-Bahá, 1982c; Effendi, 1974; One Country, 2001; BIC, 2003, 2009b; Esslemont, 1980; Karlberg, 2004; Abizadeh, 2005). From a Bahá'í point of view, however, a “viable alternative” can be found in the Bahá'í electoral system, as explained by political scientist Arash Abizadeh (2005), who offers an analysis of the Bahá'í approach to representative democracy and the electoral process. Many critics bemoan the apparent shortcomings of multiparty democratic electoral politics. That such elections yield corrupt and morally bankrupt leaders; that they are meaningless without certain social or economic rights and conditions; that they fail to provide the electorate with any real political say or choice; that they are captured by powerful interest groups; or that modern electoral campaigns are too easily bought by money—these are all common worries. What is less common are viable alternatives to the competitive multiparty model of democratic elections. Integral to the Bahá'í approach to democracy are likewise the principle of mutualism and the consultative process used in decision making, both subjects discussed in preceding chapters. As to the accountability of Bahá'í administrative bodies, one distinctive feature here is the absence of responsibility toward the electorate for decisions arrived at. In other words, each elected representative is expected to vote on the basis of his or her own conscience as a human being and as a Bahá'í, not as a member of any specific party, voting bloc, or interest group. On the other hand, Local and National Spiritual Assemblies are elected every year through the Bahá'í election mechanism, which allows for the electability of any eligible individual. At the local level, another important arrangement is that the elected representatives must associate directly with the members of their communities once every Bahá'í month at the so-called 19-Day Feast, which means personally facing the electorate on a regular basis in a devotional spirit and to socialize as well as to take notice of community or individual concerns for the Assembly to consider. Whether or not the Bahá'í election system might prove superior from a democratic viewpoint to the multiparty system, the latter has been questioned on the basis of its perceived performance, while the former is still relatively new. Perhaps the notion of a system with neither nominations for candidacy, nor election campaigns, nor even political parties may represent too radical change for some; the fact remains, however, that the Bahá'í alternative has been used for decades throughout the Bahá'í world with high degree of overall success—having “proved eminently practical, leading to a stable, peaceful, and corruption-resistant system of administration that draws the best into the community's public life” (One Country, 2001). A Local Spiritual Assembly (LSA) is responsible for overseeing the affairs of a Bahá'í community in a local area such as a city or village. Composed of nine adult local residents, the LSA is elected once every April in a simple process: The local Bahá'ís gather and, before the ballots are cast, recite prayers and passages from the holy writings to create an atmosphere of reflection and spirituality; the ballots are then cast by secret voting—with each individual having written down in private the names of nine persons from the community whom he or she deems as best qualified to serve as elected representatives. With tellers chosen by the gathered electors, the tallying takes place on the spot and the nine individuals receiving a plurality of votes are thereby elected members of the LSA. The same basic principles are applied at the national level. Here, a national convention is held annually with the electorate consisting of delegates sent from all LSAs of the country and any of whom can be elected to serve on the National Spiritual Assembly; the nine who receive a plurality of votes are elected members of the NSA. 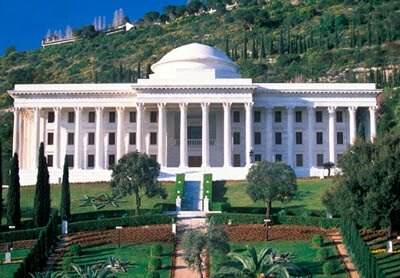 As to the international level, the supreme administrative body of the Bahá'í world, the Universal House of Justice, is elected by delegates of all NSAs in a similar process every five years at an international convention held at the Bahá'í World Centre, in Haifa, Israel. Overall, a system of governance that encompasses the global level without losing touch with the national or even the local level, is likely to attract growing attention and is justifiably a subject of interest for students of democracy. Further research into its philosophical foundations could offer a basis for rethinking entrenched assumptions about democracy and elections (Abizadeh, 2005; BWNS, 2009f). The apparent benefits associated with the system include the following: The absence of nominations or so-called candidates gives the electorate full freedom to vote for those perceived as best qualified; with the absence of campaign promises, party affiliation, and constituency demands, the elected representatives retain freedom of conscience in decision-making; the absence of corrupting financial influences in the form of e.g. campaign money; the absence of electioneering and nominations reinforces the emphasis placed by the voters on spiritual attributes and moral leadership, effectively blocking those who seek a political career for personal gain or privilege; power by arbitrary will or personality is made obsolete as decision-making rests with corporate bodies, and with the spirit of continuous learning and the centrality of the principles of the Bahá'í Faith (BWNS, 2005; One Country, 2001). —From "Nonpartisan Engagement in Public Affairs: A Critical Analysis of the Bahá’í Approach to Dialogue, Democracy, and Diplomatic Relations"
How to receive positive representation in the media: an advisory for a local charity caring for the elderly. The way the media present persons, organizations, places, and events should never be seen as truly objective reflections of reality — it should rather be perceived as constructs, acts of volition, never neutral, always more or less biased, ever influenced by a range of variables. Media representations of groups or categories of people sometimes tend to be overly simplistic, or stereotypic. Fortunately, the old problem of stereotyping of the elderly is seen to be somewhat on retreat in the media. However, recent shock advertising campaigns by charities involved in caring for the elderly, attempting to command the attention of potential donors, could cast an unfavorable light on the whole sector and might threaten to refuel ageism in the media. • Proper media coaching of those who will be charged with a spokesperson role. This report aims to outline the ways in which representation works in the media — particularly with regard to how elderly people are represented — and to offer strategic advice on how to interact effectively with the media, with the purpose of ensuring sustainable success: generating a strong public image largely through good media coverage. The context is that of a local voluntary organization specializing in caring for the elderly. The organization has lately been subjected to what’s perceived as a potential threat to its vital funding in result of the advertising activities of other organizations involved within the same area of activity; those organizations have started using so-called shock tactics to attract public attention. While such campaigns may put people off, they could also jeopardize the good reputation of all charities involved in caring for elderly. Worse, the backlash could, arguably, fuel renewed growth in ageism, the practice of stereotyping elderly people. Literature dealing with media representation — the way in which the media re-present or construct their own versions of reality — and problems related to such representation, including stereotyping, has been researched for the purpose of this report. Research has also been conducted into literature dealing with media relations — the public relations specialism concerned with building strong relationships with the media — as well as media management, which emphasizes a more direct and technical approach to dealing with the media. The research is used as a basis for a strategic plan included in the report — offering indications of appropriate and practical objectives while discussing plausible ways by which to receive positive media representation. Any attempt to reflect the reality of persons, processes, or situations is inherently bound by a range of physical and human limitations: in spite of conveying the idea of merely reflecting aspects of reality, what is presented through the media is, by selection of subject as well as by the process of production, a constructed version of reality — a representation (Branston and Stafford 2006; Haase-Reed et al. 2007). Media representation in arts, entertainment, literature, news, and advertising is exemplified in the use of so-called ‘code’ i.e. imagery and phrases consisting of repeated elements and ‘signs’ to signify categorization, meaning or intended interpretation — for instance, shaved head for the unemployed, luxury car for the wealthy, an old and sick person for the elderly, or children playing for a thriving community (Branston and Stafford 2006). Media representation, then, is problematic by and in itself: even with the highest of editorial standards and the most ethical and professional approach to media production, there will always be room for improvement. What seems to have given rise to a considerable body of research and debate devoted to media representation over the past few decades refers to the fact that large proportions of populations arguably presupposed to be fairly represented in the media have, nonetheless, been represented in overly simplistic ways or only very infrequently or not at all. In a number of countries including the United States, the United Kingdom, and Australia, this debate has highlighted the problem of stereotyping along e.g. racial and gender lines — and, as research related to gerontology clearly confirms, elderly people are no exception to the rule (Ramasubramanian and Oliver 2007; Dittmann 2003; Kearl 2008; Woolf 1998). A number of issues complicate the problem of representation and stereotyping: whether pertaining to business, art or literature, factors such as profession and tradition, history, genre, and the constraints of time and money, do justify and necessitate simplifications and classifications of stories and characters. Indeed, individuals and societies need short-hand references in order for their daily life to function (Branston and Stafford 2006). The problem varies according to culture and genre — e.g. in fictional works such as crime series and thriller movies there are long-established stereotypes of black criminals, arguably reinforced in recent years with the rise of gangsta rap or other elements of hip-hop culture; likewise, comedy and satire shows often use ethnic stereotypes in jokes and as part of their main content, to the amusement of their audiences including such who belong to the groups stereotyped. In news and current affairs, on the other hand, stereotyping is generally not openly accepted in developed countries. Calling for increased funding and legal intervention, Dittmann (2003) relates how geriatric psychologists seek to counteract negative age stereotypes found virtually everywhere in society, citing a report from the Equal Employment Opportunity Commission with indications of sharply rising numbers of age-discrimination complaints. In the late 1980s and early 1990s, publications such as Time magazine, the New York Times, the Washington Post, and the New York Daily News were accused of stereotyping old people (Hess 1991). But while references to age stereotyping abound, a quick glance at recent news headlines containing the phrase “old people” produces little visible proof of explicit ageism (Google 2008a); nonetheless, the phrase “elderly people” seems to offer fewer yet different replies with more stories about poverty and misery among the elderly (Google 2008b). Another, more subtle kind of stereotyping could still be thriving, as seen in the disproportionate distribution of age represented in the media relative to the population at large (Fish 2008). The overall impression, however, is that age stereotyping could be more or less on retreat, possibly in result of the dramatic growth of the elderly population in the United States and elsewhere. Effective media relations is concerned with building strong relationships with the media, and includes managing the flow of information from an organization to its publics. Listing communication instinct and communication skills, conviction, quality of story, and preparedness as key success factors, Doorley and Garcia (2007) recommend a centralized media relations function, with specifically appointed spokespersons — news media are prone to look for bad news with journalists using persuasive techniques to extract information or quotes from their subjects; the risks associated with allowing every employee to discuss organizational matters with outsiders, particularly journalists, outweigh other considerations. Without a clear message and a sense of conviction of the validity of that message, however, a spokesperson would be perceived as not very believable, which would reflect negatively in media coverage of the organization (Doorley and Garcia 2007). One of the fundamental elements of effective media management is clarity and having a well-defined core message (Stevens 2005; Stewart 2004). Above all when it comes to television, a core message is essential: people will only remember very little from a TV interview but by frequently rephrasing a core message, a spokesperson will make it easier for audiences to remember what was said (Stevens 2005). Additionally, there are a number of issues to bear in mind for those interviewed, such as displaying good demeanor, appearing professional and trustworthy, dressing appropriately, mindful of body language and tone of voice. Being well prepared implies being sufficiently knowledgeable on subjects of basic relevance for the organization as well as having rehearsed its story and core message, being mentally and physically fit, and also being acquainted with the medium in question and knowing about its audiences. Understanding journalists, what they want and why, is another vital requirement (Stewart 2004). Strategies and tactics used by media relations and media coaching professionals can be appropriate to employ, not only for those on the receiving end of misrepresentation in the media but for every organization, particularly those financially dependent on the good will of constituencies primarily communicated with through the media. How the fishing industry could employ public relations principles and techniques to combat a global threat posed by powerful pressure groups. Few if any industries have been as beset with ongoing activism as the generality of the fishing industry in most of the developed world. A vicious cycle of bad media coverage, unfavorable public policies, negative advocacy from pressure groups, and consequential damaged reputation has, with growing momentum, conspired to undermine the vital interests of the industry. Clearly, the industry’s lack of coherence translates into poor ability to communicate convincingly, which may further aggravate the situation. As much as failing to take decisive action will be seen as abdication of responsibility, breaking out of a prolonged spiral of negativity will require tedious efforts. A reasonable degree of optimism, on the other hand, suggests that well-planned, timely, and skillfully implemented public relations strategies can help bring about change for the better. After all, a sound analysis of the problem leads to the unmistakable conclusion that the fishing industry has a just cause, which in principle makes a whole arsenal of powerful public relations tools available for its use, provided sufficient funding will be obtained. Bearing in mind the vast number of fishing vessels still roaming the seas, it will arguably be perfectly possible to gather a sizeable proportion of the major operators under a common umbrella. • Restoring trust and developing long-term relationships with key stakeholders. This report looks into the question of how the global fish catching industry — as primarily viewed from a North Atlantic perspective — could utilize corporate communication strategies to tackle a long-overdue issue of antagonistic advocacy, unduly restrictive management regimes, and unfavorable public image. The purpose is to synthesize a clear and relevant picture from a complex situation in which a number of component elements and their interplay present a fairly significant challenge. Based on industry and academic literature — as well as first-hand experience and personal interviews — key characteristics of the fishing industry will be discussed together with fisheries science and fisheries management, and related to public relations theory and practice. For the sake of clarity, not all views will be presented in discussions about e.g. fisheries science and management. Instead, key alternative viewpoints will be considered, as these are seen to be in alignment with fishing interests. Conclusive findings will be presented as recommendations. While the context here is confined to the harvesting sector, anyone with a basic insight into commercial fishing will know that the world’s fishing fleets differ dramatically: according to geography and culture, level of capitalization and technology, access to trade infrastructure and seafood markets, types of species targeted and gear used, all of which are key determinants of vessel type, size, and characteristics such as ocean going capacity and catch efficiency. For instance, in the northeast Atlantic, one of the world’s 19 major fishing areas as defined by the Fisheries and Aquaculture Department of FAO (the United Nation’s Food and Agriculture Organization), there are several categories and subcategories of fishing fleets, listed by target species and technology (2008). An estimated 20,000 ocean going vessels, together with hundreds of thousands of decked inshore vessels and two to three million smaller, undecked boats, catch a combined 100 million metric tons of fish per year according to UN figures (FAO 2002). As in other industries, there has traditionally been a certain divide between large-scale and small-scale fishing operations, typically at odds in terms of access to inshore waters as well as in the distribution key applied to the regulation of the resource: the small and many feel threatened by the financial muscle and political influence of the large and few, who in turn tend to view the former as another source of restrictions and potential trouble. Taking such divisions to socio-economic and political levels, Ben-Yami (2003) and Allain (2007) warn against societal disruptions resulting from privatization of fishing rights, a trend discerned since the late 1980s in e.g. Canada and Iceland. Allain (2007) identifies fallacies adopted with modern fisheries management’s adherence to ideas expressed by Hardin (1968) — the underlying assumption being that fishing communities are unable to self-regulate, prone to some shortsighted selfishness which must lead to depletion of the resource, necessitating external control either by paternalistic state power or by large commercial corporations. During the decades following World War II, fisheries science was introduced to public fisheries management in North America, Europe, and elsewhere. According to Jón Kristjánsson (personal communication. 10 June 2005), the new approaches to fisheries management were initially met with curiosity and expectations by the industry, as they held promises of increasing catches and profitability through the aid of scientific methods; however, relations gradually deteriorated between, on the one hand, fisheries scientists and fisheries managers and, on the other, fishermen, vessel operators, and fishing communities. Central to negative sentiment in the fishing industry is the observation that cutting back on fishing by reducing catch quotas or otherwise imposing restrictive measures has, with few exceptions, been the sole content of all advice given by the established networks of fisheries scientists to their subscribing governments. The issue of mistrust is further associated with perceived lack of communication between e.g. established fisheries science and commercial fishermen. Haggan, Neis and Baird (2007) point to the professional knowledge of fishermen — and the fact that there are indeed examples of good cooperation between them and scientists — even if there still might be a long way to go in terms of raising communication standards. A feeling of being subjected to a combination of arrogant neglect and abusive public policies has long been detectable among fishermen and their industry representatives, who have grown used to seeing their business and operating conditions changed on a yearly basis, often by the enforcement of drastic measures. They seem to sense that even if their livelihoods are dependent on their own in-depth knowledge of commercial fisheries, that expertise isn’t being taken very seriously. A few independent scientists and consultants have expressed skepticism toward the advice regularly given by the officially established fisheries science organizations — such as the International Council for the Exploration of the Sea, “the world’s largest marine science and advisory body” (ICES 2008) — and the corresponding policies pursued by their subscribing governments. To what extent can we view broadcast news as a commodity within today’s global society? “News is not a commodity — it is a vital part of our democracy,” declared The Independent on Sunday in the headline of an article written by Mark Thompson (2008), the BBC’s Director-General. The world’s most revered public service broadcasting institution quite correctly — perhaps as a matter of policy — refuses to reduce its product to a mere commodity. Yet a quick analysis of the bulk of news and related content coming from leading international broadcasters will immediately raise the question of news commoditization. It will be likely to lead to the observation that the overall quality of mainstream broadcast news — the perceived relevance to public interest — has been deteriorating for any number of years, effectively causing a crisis of credibility. Arguably, the blurring of the boundaries between news and entertainment, information and advertising, together with the media’s peculiar interest in singing their own praises, does little to help the situation. The huge volumes of news made available every day and the overwhelming feeling of sameness often experienced by the news consumer easily invoke the concept of commodity. But before we embark on an exploration of this issue, we must ask ourselves what a commodity is. A standard dictionary lookup will define it as: ‘a mass-produced unspecialized product’ or ‘a good or service whose wide availability typically leads to smaller profit margins and diminishes the importance of factors other than price’ (Merriam-Webster 2008). In order to understand the issue of broadcast news commoditization in a global context, we need to identify and study the consequences of some of the conditioning factors. One of these can be seen as an overarching theme: globalization and history — the forces of cultural, political, social, and economic change. Underlying factors include: television’s historic relationships and affiliations with radio and cinema; the development of video, cable and satellite technologies; free markets, transnational competition, and ownership concentration; cross-media publishing and promotion; the fusion of information and entertainment, of advertising and editorial content; marketing needs and dependency on audience ratings; public service vis-á-vis economics; 24-hour news channels and narrowcasting; streaming audio and video, mobile radio and television and the astonishing development and worldwide distribution of digital ICT. On the whole, a distinct and seemingly direct cause of news commoditization came with two relatively recent revolutions that sent news supply sky rocketing: rolling news broadcasting and online news and information, much of it freely accessible. McNair (2003) gives an account of the development of news media in the UK, including the transition from radio to television as the news medium of choice for the masses. Back in the 1950s, the presentation of TV news resembled the already established tradition of radio news while reflecting the educational tone of the day. To the point of kinship with the world of film, Curran and Seaton (2003) relate how technical staff for early television often consisted of people with a background in cinema — contributing to a clash of cultures. Before long, as Finnegan (2008) outlines, American television broke away from its radio roots and learned to make use of its visual advantage, taking a pivotal role in the rise of the entertainment culture during the years and decades that followed. While entertainment gradually gained prominence, a celebrity culture likewise became apparent among national TV news presenters, spawning a new meta-category of news about the news. People are slowly but surely turning away from TV news. Roberts (2008) points out that the major networks in the US have lost an average 1 million viewers annually over the past 25 years — an overall trend that seems to reflect a steady decline with temporary reversals at the occurrence of extraordinary events. On such events, Bauder (2008) reports that more than a record 43 million American households watched the 4th November 2008 presidential election returns on television, whilst another 27 million followed the event on the internet. The historic election of Barack Hussein Obama was witnessed around the world and clearly had a global impact. The rise of 24/7 rolling news was initiated with Turner Broadcasting System’s 1980 launch of the Cable News Network. Its unorthodox format departed decisively from the traditional studio-centered news presentation with a cost-efficient operation and an informal style and with key emphasis placed on live coverage from scenes of events. CNN changed the face of broadcast news and, as its success unfolded, the established TV networks attempted to follow suit but initially failed (McNair 2003; Turner 2008). Today there are several rolling news channels with current affairs and documentary programs — CNN, BBC World, Fox News, to name some — and scores of other channels dedicated to narrowly defined markets, such as Bloomberg Television, Discovery Channel, MTV, etc. A new generation of rolling news channels — notably Al Jazeera, Telesur, and France 24 — are now seen to represent a ‘contra-flow’ to Anglo-American influence in the arena of global media communications (Thussu 2007). Back in the 1980s and 1990s, and even into the 21st century, a wave of privatization and deregulation took place in broadcasting across national borders, spurred on by the dominance of free market ideas. This was intertwined with technological breakthroughs in video, cable and satellite communications, all of which had vast implications for the development of broadcast media (Curran and Seaton 2003). Industry consolidation with mergers and acquisitions followed, generating a hostile business environment for independent news broadcasters, and resulting in ownership concentration with fears of corporate censorship and uniformity in the news. The 1996 acquisition of Turner by the largest player in the global media industry, TimeWarner — formed in 1990 with the takeover of Time by Warner Bros. — was but one of a number of deals, the net result of which has been that little more than a handful of conglomerates control most of the entire world of news and entertainment media: TimeWarner, Disney, NBC Universal, Vivendi Universal, News Corporation, Viacom, Sony, Bertelsmann (Branston and Stafford 2006). This remains a major concern and the subject of debate at all levels, including at the World Electronic Media Forum (WBU 2007). In the US, for instance, Scott (2004) criticizes the Federal Communications Commission for relaxing broadcast ownership limits, echoing concerns of media reform organization Free Press (2008). Other noteworthy developments in the media industry included Microsoft’s 1996 entry into broadcast news through MSNBC — a joint venture with NBC — and Google’s acquisition of YouTube in 2006. Google and Microsoft have developed advanced internet news delivery services in cooperation with a wide range of news providers, offering content that includes text and pictures as well as streaming audio and video, and both companies hold stakes in mobile communications through the Windows Mobile and Android platforms, respectively (Microsoft 2008; Open Handset Alliance 2008).